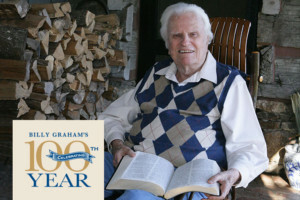 This week the revered reverend, Dr. Billy Graham turned 99 years old and BGEA is celebrating all year as he turns the corner into living a century. Very few live to be one hundred and even fewer know firsthand what it has been like to be used by God like this gentle giant from North Carolina. He is among the world’s most respected humans to ever live and Dr. Graham would be the first to note that all glory goes to God. Pastor Rick Warren recently said in describing America’s pastor that he (Billy Graham) has integrity, humility and generosity which all reflect Christ and the fruits of the Spirit. Today, we don’t need more religious “nuts” but God does requires fruit. INTEGRITY – I shared recently at a public school assembly in Alabama if you have a chance to develop integrity or drive an Infinity pick the first because it will drive you further on the road of life when the car breaks down. Character will take you more places than a car and Dr. Graham is integrity personified. Some believe that you get ahead by leaving others behind or get elevated by belittling another but Dr. Graham constantly emphasized TEAM and complimented others. About four years ago, I had the privilege to visit the Crystal Cathedral in Garden Grove, CA. I learned a story of when Dr. Robert Schuller invited Dr. Graham to preach at his church but his travelling ministry hindered him from making it happen. Plus, crowds would fill stadiums to hear him preach the Gospel and the local church was rarely a good fit but he was able to finally honor that request before retirement. Dr. Schuller shared in all his years as senior pastor of that glass edifice he rarely made the effort personally to meet a guest speaker outside the church. However, the day Billy Graham came he was out front awaiting his special guest preacher. Dr. Schuller shared later that in his mind he was prepared for an entourage or motorcade and when he arrived it was just Billy and his Bible. Looking back, he said that was one of the secrets to his success. A humble man preaching the saving Gospel and his words were always sincere yet simple that minds, hearts and lives the world over of various education or lack thereof could grasp and implement. He was simply profound and profoundly simple. When the gorgeous library bearing his name opened in Charlotte with four living U.S. Presidents in attendance he was asked what was his first thought after taking the tour was and he humbly replied, “It is too much Billy Graham! I pray all the honor and glory goes to Christ alone.” Put integrity and humility in a blender and what pours out is a life surrendered to Christ. GENEROSITY – Dr. Graham invested into tens of thousands of pastors over seven decades of ministry and more often than not under the radar with no fanfare. He lived to bless others and elevated them and their office with no hidden agenda. When the Civil Rights were left out at the time in the 1960’s he was asked to preach only to an all white crowd and he said a resounding “NO!” Dr. Graham shared at the foot of the cross the ground is level and Christ died for all people and if he didn’t have the privilege to preach to a combined crowd opened to all than he was not coming. The rest is history and Dr. Graham stood strong and the crusade continued with blacks and whites attending together and many placed their faith in Christ. Dr King and Dr Graham together were friends, brothers in Christ and forged an alliance of unity to bring folks together. He also helped mentor many church leaders and provided resources that were FREE or little cost. For years, BGEA offered scholarships to attend the Billy Graham School of Evangelism of which I was a recipient in 1999 to personally go in Monterey, CA and my training was a gift. I was arguably the youngest to attend out of 900 that year and Dr. E.V. Hill signed my Bible after he spoke to a packed ballroom and I had honor to meet Dr. Graham’s longtime secretary. However, it was a reality because of his desire to give back and pour into the next generation and it is humbling but it was Dr. Graham’s son in law who offered me the contract position for My Hope with Billy Graham, Billy Graham Evangelistic Association and Franklin Graham’s Decision America Tour. In closing, rewind a quarter of a century and on Billy Graham’s 75th Birthday “Good Morning America” came to his humble log cabin home in Montreat, NC and had an interview with the world watching. The female reporter asked the aging evangelist with the love of his life, Ruth by his side, “Dr. Graham – after ALL you have done for God. What will be the first words you say to Him when you meet Him?” Without missing a beat and a tear in his eye he politely said, “You have it backwards. It is not what I hope to say to my Savior but what I hope my Savior will say to me. Well done thy good and faithful servant.” I have no doubt that he will hear that and then some. On the cross, Jesus dying act was leading someone to Himself. One thief rejected Him but the other accepted Him. Today, you have must choose as well. Indecision is still a DECISION and Jesus said, “Today, is the day of Salvation.” The brand new evangelistic outreach “FLYING BLIND” was released this week on Dr. Graham’s 99th birthday. It may be the most powerful 20 minutes you watch in your entire life and our prayer is that many come to saving faith in Jesus and strengthened in their journey by this film. Like John the Baptist before him all Billy Graham wanted to do was decrease so God can increase. Enjoy this powerful film, happy birthday Billy Graham and all glory to Christ.